With an average of 228 sunny days per year, it&apos;s no wonder Austinites love the outdoors as much as they do. On any day of the week, locals and visitors alike can be found along Austin’s streets and trails, in its parks and on its shorelines, in the water and on the water. Beyond that, though, are a world of opportunities to enjoy everything under the Central Texas sun outdoors. One needn’t be an outdoor enthusiast to find ways to enjoy everything from art galleries and films to flea markets and live music - outside. 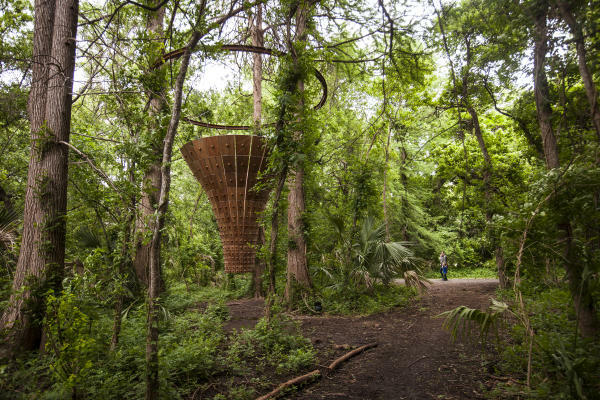 John Grade, Canopy Tower, 2015. Ipe wood, rope, steel, and wire. 15 feet 9 inches high, 15 feet diameter. Installation view, The Contemporary Austin – Betty and Edward Marcus Sculpture Park at Laguna Gloria, Austin, 2015. Courtesy the artist and Cynthia Reeves. Photograph by Brian Fitzsimmons. HOPE Outdoor Gallery is a "community paint park" backed by local nonprofit HOPE Events and created to give artists and muralists a space to contribute their art. Located at 11th and Baylor, artists can register for free through the nonprofit to contribute their visions to the project. The park’s mission is “connecting creatives with causes”—both visual artists and musicians. It’s a vision that is very representative of Austin. You’ll find another outdoor art experience at the sculpture gardens at Laguna Gloria, which is part of The Contemporary Austin art museum. The Betty and Edward Marcus Sculpture Park is nestled among the park’s 14 acres and its gardens, shaded by old live oaks and backdropped by Lake Austin. Many of the sculptures are grand in scale and showcase work from locally renown artists. Just next door to Laguna Gloria are the grounds of Mayfield Park and Preserve, which are home to beautiful gardens, ponds, and the park’s much-loved peacocks. Taking a stroll through the grounds is peaceful and relaxing and makes a great place for picnics and photography. If you take a short drive outside of town toward Johnson City, you’ll find Sculpture Ranch. Once Lyndon B. Johnson’s deer-hunting ranch, the 140 acres of trails house more than 100 sculptures by 40 artists. Sound & Cinema. Credit David Brendan Hall. Outdoor films are a staple on a warm Austin evening. Between spring and fall, there are numerous places that host outdoor movies, ranging from pop-up movies in Austin’s many parks to drive-in movies and classic movie snacks at the Blue Starlite Mini Urban Drive-In to the old-school, outdoor Corral Theatre in Wimberley, Texas (about 40 miles outside of Austin). Alamo Drafthouse hosts pop-up films throughout the city, ranging from themed events complete with props and commentary to full-on field trips where guests paddle down a river to a riverside pig roast and screening of a classic film. Even more, the Drafthouse partners with the Austin Parks Foundation to host films at Austin-area parks. This year’s schedule can be found here. 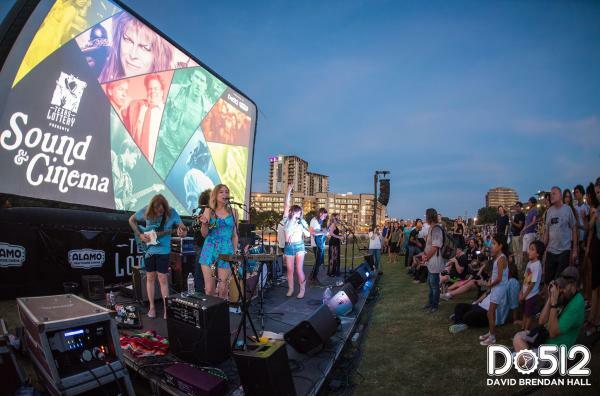 Sound and Cinema is a popular event held every summer in Austin showcasing a movie on the Long Center lawn afront Auditorium Shores and the Austin skyline every other Wednesday. A local band kicks off the movie screening and on-site food trucks serve up cocktails and snacks for the events. This guide would be incomplete without mentioning Austin’s acclaimed Blues on the Green, a summer concert series hosted by Austin City Limits Radio at Zilker Park. The free summer concert series is dog-friendly and usually kicks off just before sunset. Local food trucks provide snacks, while some frequent attendees pack a cooler along with their blanket for sundown jams with the Austin skyline in the background. It’s difficult to keep track of the number of outdoor markets and shopping experiences in Austin. 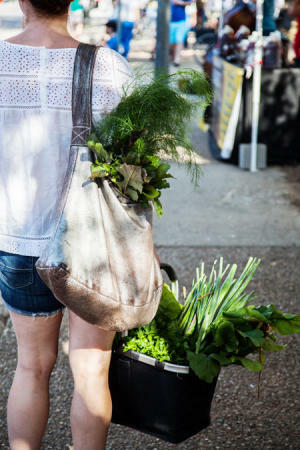 From pop-up flea markets to street vendors to farmers markets to costume sales, there is always an outdoor market full of curiosities, local artisans and craftsmen, and local products to peruse. South Congress’s First Thursdays are great events showcasing the best of Austin artists, jewelry designers, and craftsmen. Between Barton Springs Road and Elizabeth Street, the busy street is lined with tables featuring all kinds of interesting finds. Handmade earrings, dream catchers, paintings, instruments, you name it - you’ll find it at First Thursdays. Yellow Jacket Social Club is an East Side favorite - a bar and social club that hosts interesting events throughout the year. Its popular pop-up flea markets always have a mix of vintage, antique, and unusual finds. We won’t drop names, but you may even find well-known Austin musicians cleaning out their closets and selling half their wardrobe within the social club’s patio. While it’s not technically *all* outdoors, South First Street is home to some of the city’s most loved thrift shops, many of which are housed in old bungalows with porches and front yards overflowing with racks of clothes, jewelry, hats, and accessories. Take a stroll down South First, popping in and out of these shops is a very Austin way to spend a sunny afternoon. And these are, of course, just a glimpse of the ways you can spend leisurely time in the great outdoors enjoying Austin’s arts and cultural scene. While many of these things take place through the spring and fall when the weather is the nicest, on any given day you’re bound to find something, quite literally, pop up - be it a flea market, a concert, a mission-based event, or any other thing that helps "Keep Austin Weird." Contributed by RootsRated. SFC Farmers Market photo courtesy of the Sustainable Food Center, credit Thomas Winslow.